Each one of our selected wild botanicals has been ethically sourced, many foraged daily by James, and are native to the Suffolk coast. On the marshland that divides the North Sea from the River Alde, the harsh sea gives way to endless shades and textures of green; hundreds of herbs, grasses and flowers growing within one area. Each botanical is carefully considered, picked and dried at the optimum time for the best impact on our flavour and aroma. Like the wild seas that inspire us, our botanicals cannot be truly tamed. Every batch of Fishers will be slightly unique in its creation and singular in its flavour. Fishers is a genuinely artisanal product working perfectly alongside nature itself. Fishers Gin combines rare old English herbs and botanicals with distilled barley, sourced entirely from East Anglian farmers. 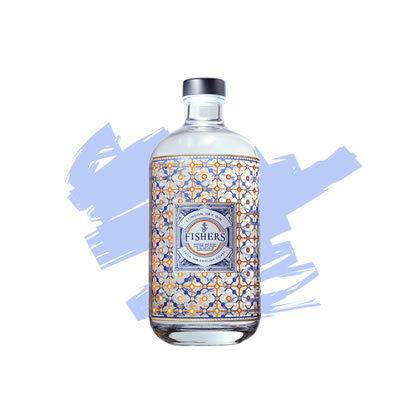 Born from the union of master distiller John McCarthy and Oxford University botanist James Firth, Fishers Gin reflects a passion for nature and research, capturing the wild and forgotten flavours of the English coastline. Infusing these mystifying and intriguing aromas with traditional botanicals, Fishers is more than a gin, it is an expression of the English coast; its awe-inspiring natural landscapes and the captivating traditions that have flourished there for so long. Our distilling process is unique. While the majority of gins re-distil alcohol from spirit grains, ours is crafted straight from the barley found in the grassy headlands that surround our Suffolk distillery. This process means our gin has a particularly full bodied texture and flavour that provides the perfect canvas for our herbaceous and extremely aromatic botanicals to shine through. This combination of traditional gin botanicals, rare plants and foraged herbs that have been used for centuries to flavour coastal dishes, makes Fishers Gin truly unequalled. The bouquet shows a rich, wet, herbaceous aroma. A thick layer of spignel which provides a huge, highly distinct (cumin/caraway-like) aroma, that is further accentuated by bog myrtle. The unfamiliar nature of the botanicals means that there is nothing one can quite place a finger on, though there is an overwhelming sense of underlying, almost mentholic spice. The medicinal nature of the spirit carries through to the palate; juniper isn’t immediately obvious to taste, instead the English botanicals shine. Spice hits the back of the throat and the coriander brings a real, deep warmth to the citrus. Juniper as an singular ingredient isn’t obvious, more so at the end, wherein the mouth is coated with a sharp, piny taste. 1. Crush the red pepper and cucumber in a shaker with the Wasabi. 2. Add the carrot juice, oyster sauce, lemon juice and a pinch of salt. 3. Add the Fishers Gin and shake well. 4. Strain into a long glass with plenty of ice and top with tomato juice.